The Wally Euro slim wallets are perfectly suited for carrying international currencies and coins – even in your front pocket. Charleston’s own Distil Union is expanding their line of minimalist leather wallets with the addition of the new Wally Euro. Characterized by the Wally’s distinct pull-tab functionality, this billfold-style wallet is perfectly suited to accommodate larger-format bills like those of Europe, Canada and Australia. Crafted of Argentine leather with interior metal money clip, two variations of the Wally Euro are available: One with a squeeze-lock coin pouch, and the other with double card capacity. In designing the Wally Euro wallets, the small team at Distil Union reflected on their travels to places like Hong Kong, Italy and Canada, where coins and bills are noticeably different than those in the US. Based on their own experiences as well as feedback from Wally Wallet fans across the globe, Distil Union has crafted two styles to suit different currency-carrying preferences: The first features a squeeze-to-open coin pouch to conveniently hold a handful of coins right in your wallet. After a trip to Hong Kong, Distil Union’s Lead Designer Nate Justiss observed, “The coin-pouch really gave me control of my loose change – especially those large dollar coins. 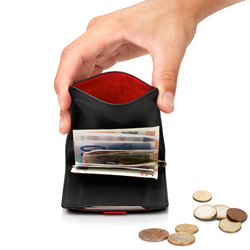 Beyond being convenient, Wally protected the other things I carry in my pocket.” The coin-pouch style also features a pull-tab pocket for cards, while the second Wally Euro style features two pull-tab pockets for those who wish to carry twice as many cards and business cards. Each side features a different colored ribbon for effortless organization of contents, so you know at a glance which pocket to pull from. Both Wally Euro styles have an interior spring-loaded money clip to secure both bills and receipts. With the demand for minimal wallets growing, and so many options on the market, the Wally wallets offer unique functionality by design. The satisfying pull-tab action “ejects” the cards hidden inside for access without opening the wallet; pushing cards back into the pocket will retract the tab. By employing the pull-tab and eliminating the usual interior dividers, Distil Union has distilled the wallet down to its essentials – making it possible to carry the same number of cards and cash in a wallet only a fraction of the typical size. The result: A wallet so slim, it can be comfortably carried in a front pocket, alleviating back pain suffered by many men across the globe. Indeed, Wally has become a tried-and-true solution to “Costanza wallet syndrome” from New York to New Zealand. Tanned leather from Argentina has been selected due to the unique balance of softness and durability. Over time, Wally Euro will age gracefully and conform to whatever is carried most. Wally Euro Wallets are available now exclusively on distilunion.com for $69.99. Media members interested in more information may contact Lindsay Windham at (843) 801-5550 or email lindsay(at)distilunion(dot)com. Launched in 2012, Distil Union is a micro-collective of designers in Charleston, SC with over a decade of experience in the Apple accessories market. “Distil” references their philosophy of getting to the essence of a problem and solving it with design that’s simply useful, attractive and considered. “Union” – that’s easy, it’s how they’ve joined together to have fun (and work hard) creating solutions to real-life problems. Since the introduction of their original Wally Leather Wallet for iPhone on Kickstarter in 2013, Distil Union has been on a mission to simplify what we put in our pockets and minimize the everyday carry. For more information please visit http://www.distilunion.com.